I was chatting to my mum on the phone the other night and telling her about our new fireplace, and it got me thinking. I remember going for Sunday walks along the canal and everything was frozen solid and the ducks and swans were skating! We would head home for milky coffee or hot chocolate and thaw out in front of the fire. This was the scene at the back of our house. We had central heating in the form of radiators but during the real Winter months what I really wanted was a real roaring fire. In one living room we had a gas fire that was supposed to look like a real fire and in the other was a fireplace that was just for decoration. I couldn't believe my luck when I came to look around the house that we eventually bought here in Queensland and noticed that it had a real open fire. The previous owners told us that they hadn't used it in over ten years, but I wasn't perturbed - it was a fire, a real fire! Isn't it ironic that I move the other side of the word, to a different hemisphere and to a warm sunny country and I get my sought after fireplace? The other reason might have been that we had some possums living in the chimney. They would sleep there during the day and then in the evening would emerge. Most of the time they knew that the way out was up, but occasionally we would have a visitor in the room. A little snout would appear upside down and then if he felt brave he would come in to see if there was any chance of food. After we bought the place we found out that the previous family had tamed one of the possums and he would join them for supper each night - honestly! It took some thinking how to discourage this and we eventually put a grate on top of the chinmey. Not as easy as it sounds when possums are nocturnal and going up a ladder after dark was not an appealing thought! Anyhow, our fireplace is now complete and this year we're really enjoying it. Here's some before, part way there and after photos. As we wanted to actually use the fire, the plasterboard soon proved a problem as the smoke was making it dirty, the plastic trim melted and there was only so much cleaning I could do before the paint began to disappear. So this year we have a rather traditional cast iron fireplace and mantle. The brick is still there as a hearth and I quite like it as it takes away from too formal a look. These were some of my insprational shots when I was looking to see if keeping some bricks would work. The fireplace opening was too wide to be able to fit just a mantle so we had to buy an actual insert.The third shot is from the old favourite "Somethings Gotta Give" house, but I'm afraid I can't source the other two. Some years ago I would never have imagined that I would be living in Australia and sitting in front of a real roaring fire wrapped up in a wollen cardigan with ugg boots on my feet....who would have known?? What an enjoyable read. When we moved in we had an old freestanding woodheater that was rather buggered so we ripped it all out and and installed a steel fire box and heater along with a nice mantelpiece. I think it looks beautiful and the heat is amazing. I'm sitting in front of it right now! How cute to have tame possums, though not sure I'd want them in the loungeroom! Thanks for visiting my blog and leaving a lovely comment! I'm so glad you enjoyed the painting post and that it inspired you, just a shame i lost most of the comments to that post as there were other useful tips from other bloggers. Loving your blog, how different it must be living there compared to where you grew up! Love the possum story, and your new fireplace looks perfect! Look forward to visiting you again soon! Hi Beth, thanks for your lovely comments about Lois. It makes me laugh, how the young ones know how to pose for a photograph. I hate my photo being taken and I never like the way I look, but if I were young I could just pose and they would come out brilliantly. I'll have to get some lessons from Lois. Good idea about the Jo Malone bags and then your hubby has a constant reminder of what you like! 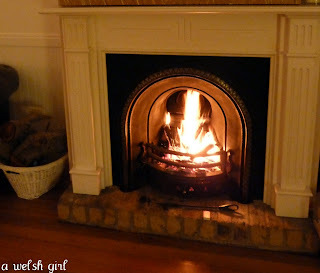 Lovely post and love your fireplace. Thanks for adding your link to BC Good Life Wednesdays.